Delivery Option Price inc vat Signature Required? How long will it take to arrive? Service guaranteed? Non UK Mainland (Zone 1) prices shown below are subject to change based on couriers' rates. *Prices do not include international shipping insurance costs - costs vary depending on size and weight of goods, call a member of the sales team for more information 01202 717 191. Free carriage and packing - UK mainland (Zone 1) only (does not apply to re-deliveries or special deliveries) on all online orders over £149.99 (i.e. of £150 upwards, including VAT). Orders of £149.99 (including VAT) or less will incur a carriage and packing charge of £9.95. We have a 13:00 hours cut-off for next day orders. We will endeavour to ensure that orders received before the cut-off are dispatched that day, any orders received after the cut-off will be despatched the next working day. If you live outside the UK or Eire then telephone or email our sales team to find out delivery charges to your address. 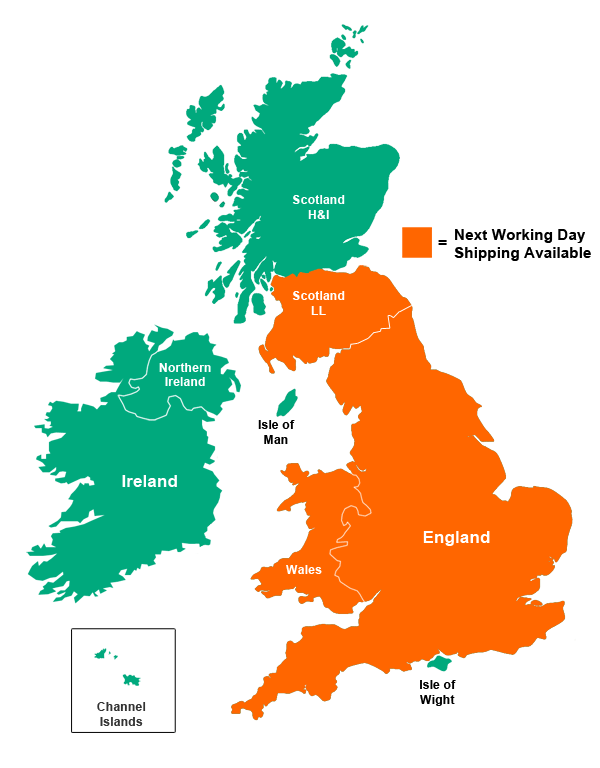 We endeavour to ensure that your order arrives within two working days of despatch and many arrive the next working day, (Eire, N. Ireland, Highlands and offshore destinations may take a little longer). As our deliveries are sub-contracted to third parties, we are unable to specify a delivery time. However, we are able to offer the following services at an additional cost: Weekday next day delivery; Weekday pre-midday delivery; Saturday pre-midday delivery. PLEASE NOTE: due to the high value of our goods, our carriers are instructed to obtain a signature of receipt, therefore someone should be at your delivery address to receive the goods. Normally, our deliveries are made by APC and a signature is always required. If there is nobody available to receive the delivery at your stated delivery address, the courier company will usually leave a card for you to organise your own collection from your local depot. If you require redelivery due to no-one being there, then each re-delivery must be paid for in advance; the cost of each redelivery will be a minimum of £9.95 + VAT, or 50% of our normal (non-promotional) delivery charge + VAT - whichever is the greater. Strict enforcement of this delivery policy helps keep our delivery charges to a minimum for GateMotors customers. Please refer to our terms and conditions of sale before finalising your purchase.